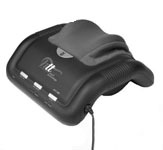 HTT-300 Back and Neck Massager from Human Touch - Twin, custom-designed “Ergo-Pad” massage heads for deep percussion massage, Scientically-located Acupressure nodes stimulate ALL of your feet’s pressure points at once, Powerful four-speed motor with automated “program” mode, With speeds ranging from 1900 to 2600 percussions per minute, the EQ-400 delivers the most stimulating massage available. HT-300 Back, Leg and Neck Massager by Interactive Health with Human Touch Technology is a true step forward in Robotic Massage technology. The result of years of research and development, this revolutionary system emulates the latest techniques used by massage and chiropractic professionals for back and spinal care. How does it work? It starts with a multi-patent pending mechanism that acts like "wrists and arms". The "hands" consist of two, three dimensionally moving discs, which are surrounded by a firm, yet comfortable material that feel like "fingers and thumbs". Working together, these Robotic components deliver a variety of massage functions that feel great, and really work. Just make yourself comfortable, and rest your neck in the soothing "hands" of HTT. It will go to work relieving stress, tension, and pain. The kneading and compression functions of the HTT-300 manipulates soft tissue with deep massage, reducing pain and improving overall spinal health. The "hands" consist of two, three dimensionally moving discs, which are surrounded by a firm, yet comfortable material that feel like "fingers and thumbs".